Although week two of our Community Studio Program was altered due to unavoidable scheduling conflicts, we carried on despite these changes and held our second Drawing and Sculpture Studios in our newly renovated Barn Studio at the Empower Youth Ranch! Our Community Studios offer a dedicated time and place for creativity, inviting participants to broaden their definition of art and follow new pathways of thinking and making. We began the morning of the 24th, by considering our roles as artists as akin to that of the “explorer.” One of the jobs of an explorer is to chart maps of an areas previously unknown. We decided that for the day we would become explorers of the Empower Youth Ranch, using map-making as a way of better understanding our site. How can a map be a drawing? Where does one find lines in a map? What kinds of lines can we find on the ranch? How does one make a map? Following the lead of The Situationist International, we conducted our own dérive on the ranch. Upon the completion of our dérives, we returned to the Barn Studio where we made maps to represent our individual experiences and discussed our thoughts about them. Our second project during last week’s Community Studio: Drawing involved the deconstructing and re-imagining of ready-made maps. The artists were provided with an assortment of maps of varying scales, including maps of Bethel, Clermont County, the United States, and even the world. There were maps of roadways, rivers, soil and more. The artists selected the maps they wanted to use and then, inspired by Nina Katchadourian (above), proceeded to “re-map” them, deconstructing and re-assembling them into something new. The finished works will be shown at an exhibition at the Empower Youth Ranch this Fall! Stay tuned for details! We began the morning of the 26th by considering the value of “restriction” in creativity. We watched a clip from an interview with Jack White of the rock band The White Stripes, in which he discusses his ideas on the subject. After viewing and talking about Jack White, we transitioned into the introduction of the day’s project. We decided that, in another effort to get to know the ranch, we would spend our time making videos. Each artist was instructed that they would choose one “action” and one “raw material.” To brainstorm, we looked at a few artists. We looked to Richard Serra as an example of how “action” plays a part in making sculpture. raw – adjective – (of a material or substance) in its natural state; not yet processed or purified. synonyms: unprocessed, untreated, unrefined, crude, natural; unedited, undigested, unprepared. 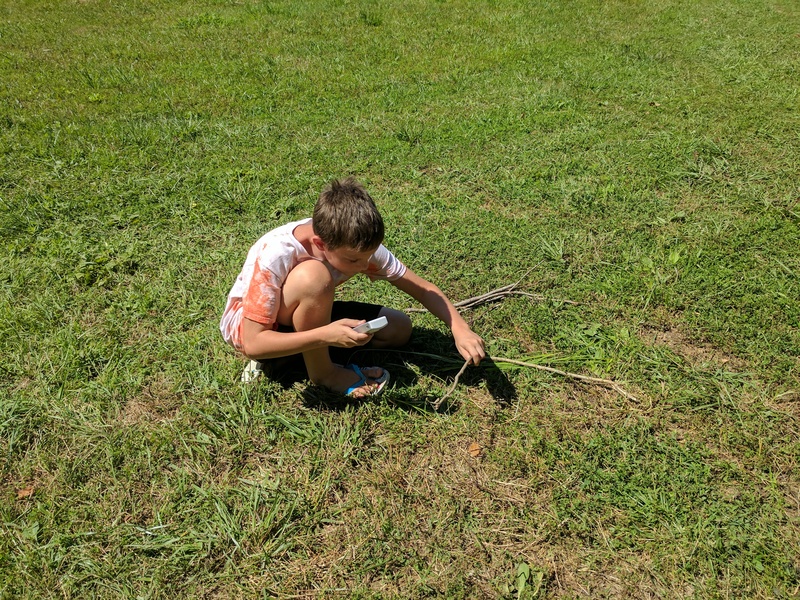 We made lists of materials that we might find on the ranch that could be defended as “raw.” The list included but was not limited to: wood, metal, dirt, rocks, plants (leaves, branches, bark, etc. ), water, ice, and paper. We then went on a walk around the ranch to begin brainstorming. The artists then returned to the Barn Studio to sketch out ideas in their journals. From this process, each artist decided their “actions” and their “materials,” as well as the site where the video of this performance would take place. Finally it was time to take action! As a group we toured the sites around the ranch that each artist had chosen and witnessed their action+material performances. Each performance was documented with a flip camera. The artists learned that restriction is a difficult concept to implement within the creative process but that it pays off big time. We are currently editing these videos and plan to premiere them at an exhibition at the Empower Youth Ranch this Fall. Stay tuned! All ages are welcome on Mondays for Community Studio: Drawing with Francesca Fiore and Hillary Wagner and Wednesdays for Community Studio: Sculpture with Hillary Wagner from 9:30 – 12:30 at the ranch. Then on Thursdays stop by for Open Studios from 11 – 6. Bring your ideas and your imagination with you for a period of free, self-directing art making. We will be available to talk about art and help bring your ideas to life! All are welcome! Also stay tuned for a special Community Studio all about technology and art led by video and performance artist Francesca Fiore. Details will be announced soon.